Never before have so many Anfield legends opened up so freely about their personal lives in print. In Liverpool Captains, R. Lund Ansnes meets many of the club's greatest figures; taking you beyond the walls of the training ground and into their homes, uncovering the human impact of leadership. The themes of identity, motivation, teamwork and loyalty are consistent but Ansnes analyses how the role of the captain has changed over the last 55 years since the appoint-ment of Ron Yeats by Bill Shankly. Yeats, indeed, is one of her 16 interviewees and like Tommy Smith after him, Ansnes details the devastating effect of Alzheimer's Disease upon their lives. We meet Steven Gerrard, Jamie Carragher and other former captains such as Paul Ince whose story involves an improbable rise from abandoned child to captain of club and country. An author of two Liverpool books, Ansnes spent three years travelling across Europe get-ting to know the legends. 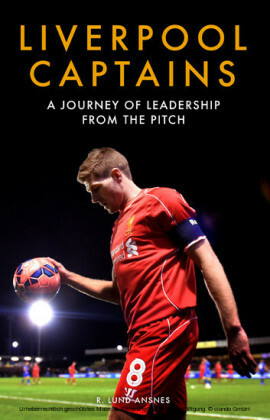 The outcome is a revealing portrait of life at Anfield, showing sides of players you have never seen before. R. Lund Ansnes is an author, journalist and broadcaster. She is the author of three books about Liverpool FC and was the editor for the Norwegian translation of Bill Shankly's autobiography. Her speciality is storytelling and to make people open up in conversations with her - for books, on stage, for TV, podcasts and radio. She is married with two children and divides her time between her homes in Norway and Liverpool. MUSIC BOUNCES OFF THE WALLS IN THE DARKNESS OF THE Liverpool Echo Arena, the city's waterside concert venue. Red and blue lights take turns in shining their way through the vapour created by the fog machine on the dance floor. We are here to celebrate the winners of Liverpool's 2015 Players' Awards. The blue light hits a shiny object that turns out to be nothing less than the honorary trophy of the club: its Lifetime Achievement Award. The trophy is floating across the floor, held by the hands of a giant from Liverpool's history. He has danced for so long now, on this warm May night, that the back of his white shirt is completely soaked. He greets us with a big, hearty smile, this giant of a man who was first brought to Merseyside by Bill Shankly more than half a century ago. He became an important piece of the puzzle that elevated Liverpool out of the doldrums and into the First Division and then on its path to becoming the most successful club in English football history. Ronald Yeats would also go on to be the second longest serving captain in the history of the club, a mile ahead of the man in third place: Emlyn Hughes. When he was appointed Liverpool manager in 1959, Bill Shankly came to Anfield on the condition that he, and not a committee as had traditionally been the case, got to pick the team. Shankly promised to build Liverpool up to become a bastion but only if he alone had mastery over his squad. Ron Yeats was an important part of his rebuilding plans: he had been captain of every team he had played for, and was almost immediately - five months after arriving on Merseyside - chosen by Bill Shankly as his leader. Shankly immediately nicknamed Yeats 'The Colossus'. 'Take a walk around my centre-half, gentlemen, he's a colossus!' Bill Shankly grinned happily at the press conference in 1961, imploring with enthusiasm and conviction that reporters should 'go into the dressing room and walk round him!' Shankly compared Yeats to a 'mountain'. On this day in May 2015, Ronald Yeats, centre-back for ten years and captain of Liverpool for nine years, has been honoured along with Ian St John, striker, best friend and room-mate through his entire career at Liverpool. There is not a dry eye in the house as Yeats and St John come on stage to accept their trophies. St John is, as ever, quick with his repartee, but of a sudden goes quiet, just as he is about to start his acceptance speech. The master of words, who still works in radio for good reason, is now looking out over the tables and sees current LFC players and their wives, and former stars like Robbie Fowler, John Barnes, Steve McManaman, Alan Kennedy, Phil Neal, Mark Wright, David Fairclough and Phil Thompson, to name but a few of those who turn up for the club when the Liverpool family comes together. Then he looks upwards to the stands: there are thousands of people who have bought tickets to honour this year's LFC prize winners. The vocal Scot, who scored shedloads of goals through the 1960s, has gone silent. He draws a deep breath, then finally speaks.